The Z Beat: The Results Are In! I asked and you answered. Of the 1,300+ of you who checked out the What kind of Zumba instructor are you? 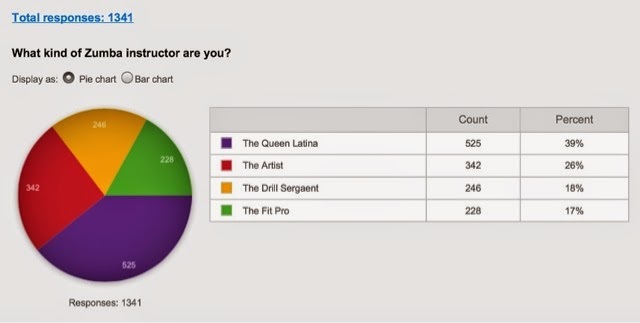 quiz, nearly 40% are Queen Latinas - no surprise there! This was really just for fun, but it did get me thinking about how different instructors can be from one another. There's a big difference between someone who emphasizes swagger from someone focused on isolating muscle groups. This is part of why I hated my first Zumba class - the instructor's style clashed with what I was looking for. It's really great that there's room for all types of instructors in the Zumbiverse and that the home office "allows" that type of flexibility. Whether someone is a former dancer, looking to lose weight, interested in world culture, or trying to build muscle, there's a class out there for them. The Artist: 5, 6, 7, 8! You have a dance background and love to shake it. You know there’s a workout happening during your class, but you’re not too worried about it. You're a performer, and taking your class is like watching a killer hip hop show. The Fit Pro: You can explain precisely how each muscle group works in each of the four core rhythms. Every move uses a fitness variation – does ANYONE really do the merengue V step without adding a squat? The Queen Latina: Que te mueve! You’re all about the fiesta and you’ll take any excuse to shake your cintura (whether you’re Hispanic or not). Your students know exactly when to yell Wepa! during class – it’s required! The Drill Sergeant: Ditch the workout? You don’t think so. We can have fun after we burn 800+ calories. Faster, lower, higher, shakier – you want it all.